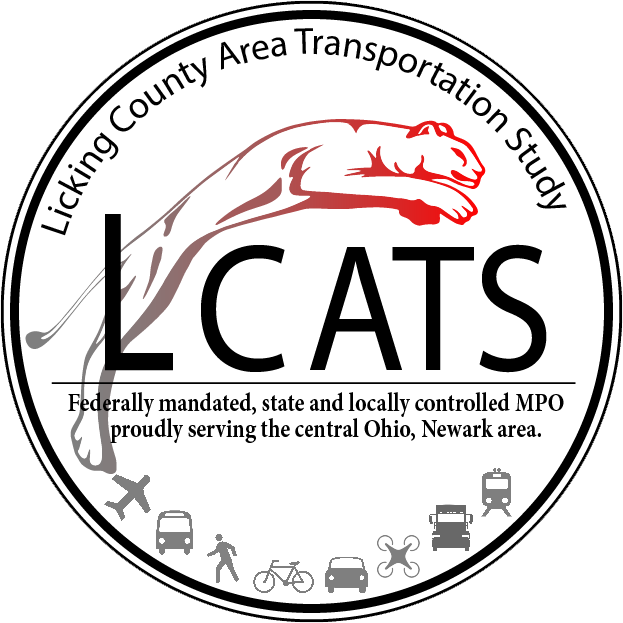 The Licking County Area Transportation Study (LCATS) is the designated Metropolitan Planning Organization (MPO) for the Newark Ohio urbanized area and conducts a continuing, cooperative and comprehensive multimodal urban transportation planning process. 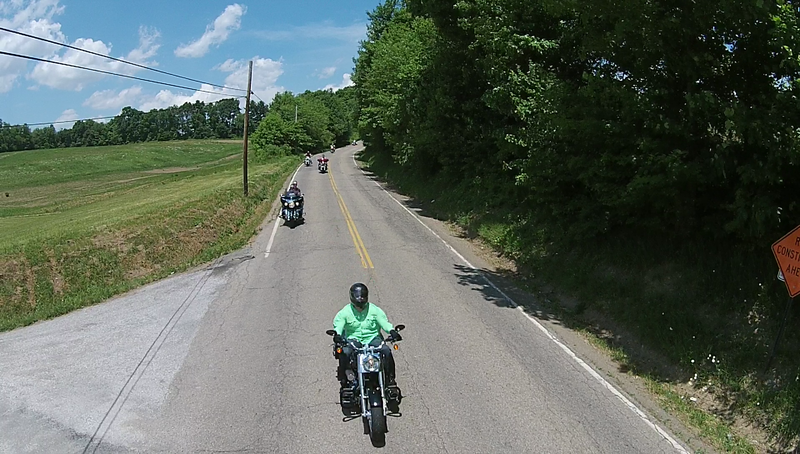 The main goal of LCATS is to utilize federal transportation funds that are available to the area to produce the most efficient transportation system possible. These funds can be used for studies, projects and improvements, including federal-aid roadways, bridges, transit and enhancement projects. 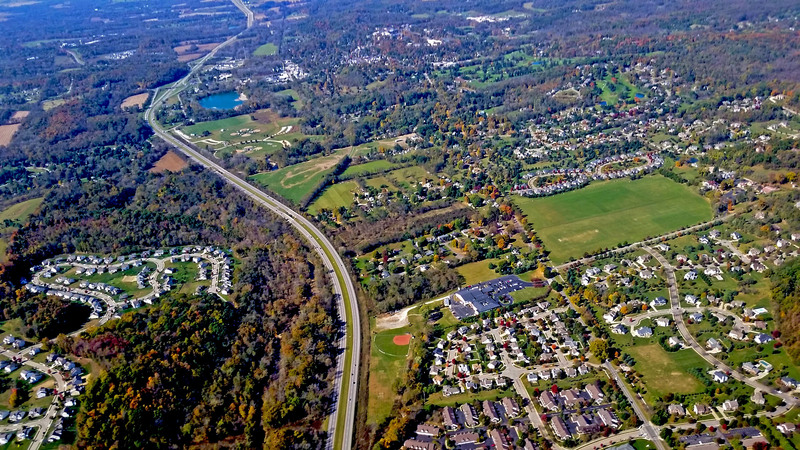 Ensure the transportation system in Licking County supports and encourages appropriate economic development and social activities, while maximizing the efficient use of our natural and human resources and minimizing adverse impacts upon the natural and built environments. 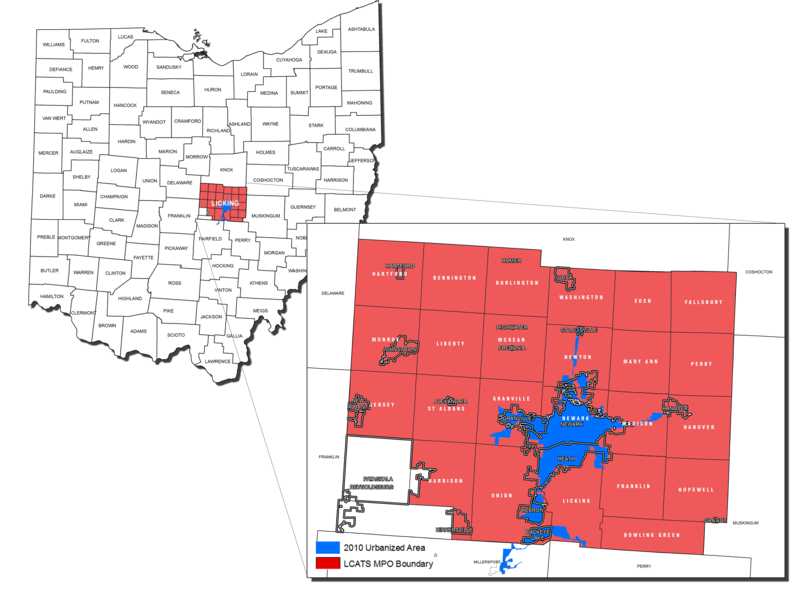 Our next Policy meeting will be May 14, 2019 @ 9:30 in the Licking County Administration Building Room D (see map under the Contact page). 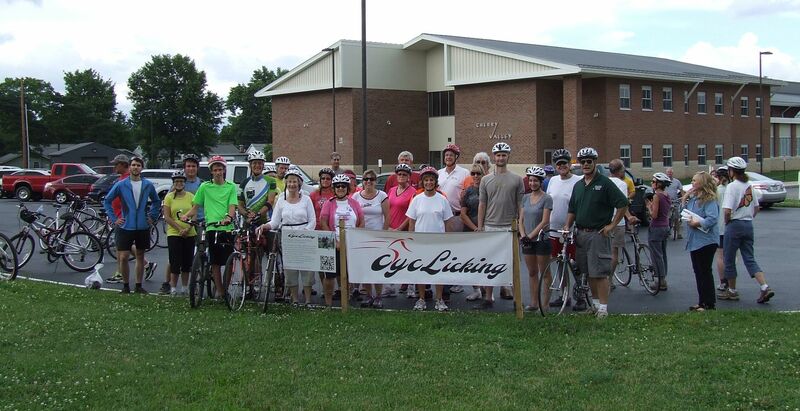 Our next CycLicking Event is TBD. 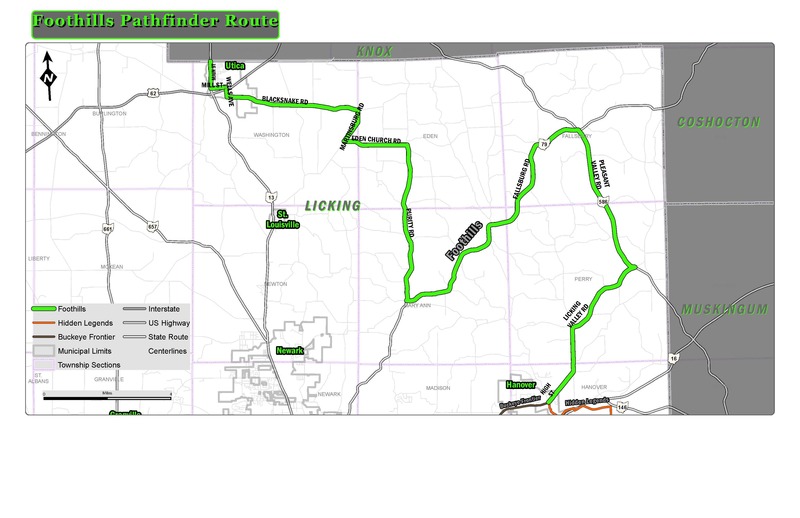 Many roundabouts have been constructed within Licking County, Ohio and more will be constructed within the coming years. This Public Service Announcement examines the proper etiquette for using the roundabouts. While this video is fun and fictional, the do's and don'ts from this PSA should be practiced on the roadways wherever you encounter a roundabout. This presentation was a collaborative effort of the Licking County Planning and Development Department and Jeanette DeRenne, AICP of the Pima County, Arizona Department of Transportation. The presentation was given at the 2015 APA Arizona State Planning Conference in Tucson, Arizona. The topic of this presentation was on the integration of state of the art technologies in small planning departments. The presentation explains a fly-by growth & development of SR161 Corridor. It introduces the concept of MIT (Manufacturing, Innovation, and Technology) Boulevard. 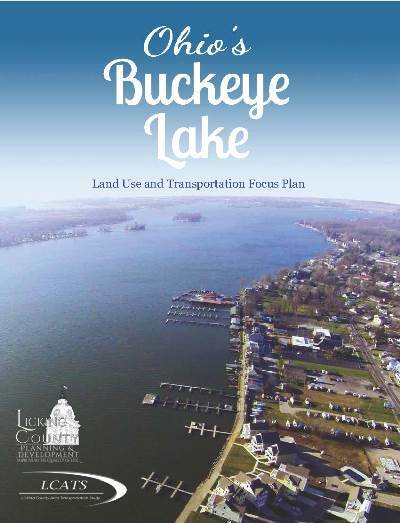 The purpose of the Buckeye Lake Land Use and Transportation Focus Plan is to create more vibrant livable communities that capitalize on the enormous resource known as Buckeye Lake. This plan demonstrates how proper preparations can position communities to take advantage of the new Buckeye Lake and the increased attention it will bring. 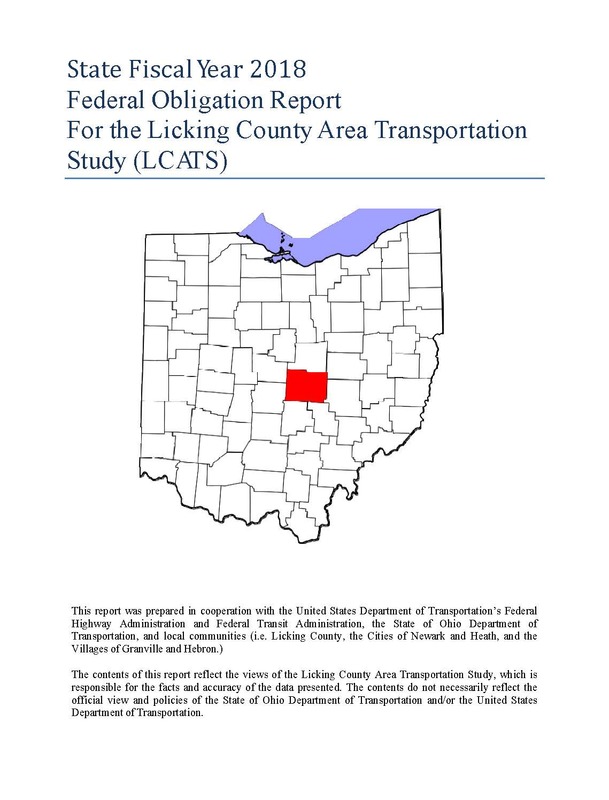 This is the Licking County Transportation Study (LCATS) formal presentation to the Ohio Department of Transportation's Transportation Review Advisory Council (TRAC). The 9-minute video captures comments, aerial videos, graphics, and the formal request for the state to fund the State Route 16- Cherry Valley/Thornwood Drive Interchange. 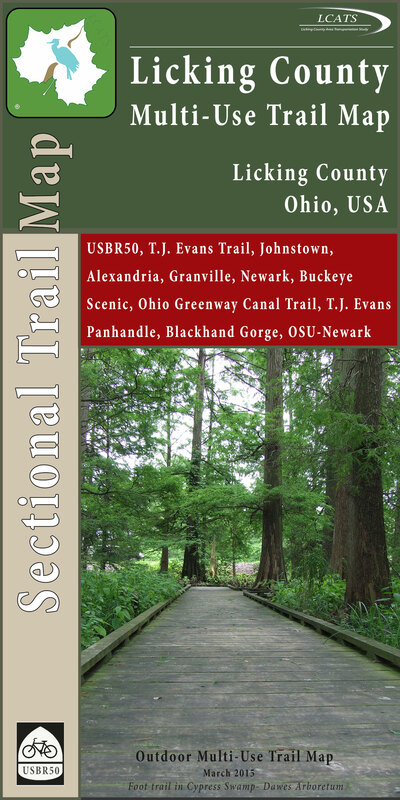 This foldable map of the Licking County Trails is designed for ease of use and compliments new planned kiosks along various trails. It reflects our research into the area, and suggestions from actual trail users. There are corresponding panel match lines on the county overview map that reflect the panel numbers on the back. The panels include the route name, mileage, panel lines, and are color coded. 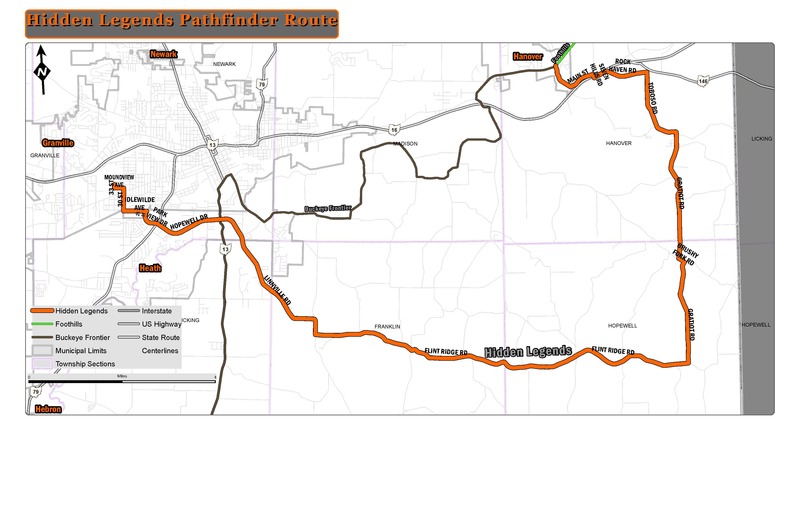 The map also shows cross streets, parking, bike shops, potable water, kiosks, and areas of interest so that the user can easily explore the area and our trail system. 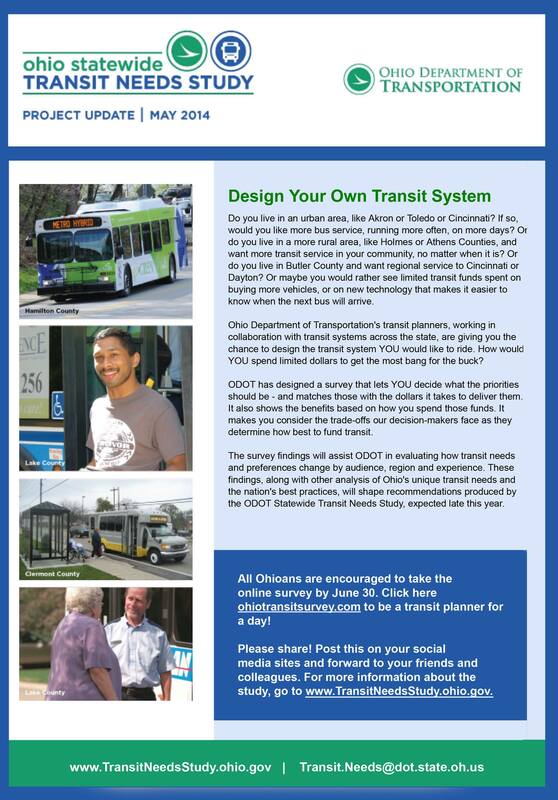 "Join the Ohio Department of Transportation at one of five regional stakeholder meetings to help shape a long term strategy for the needs of Ohio's riders today and in the future! Trends show there is a definite rise in the need for convenient, affordable public transportation to jobs, medical appointments, shopping and recreational activities. The long-range transportation plan describes the transportation improvements envisioned for the next twenty years. 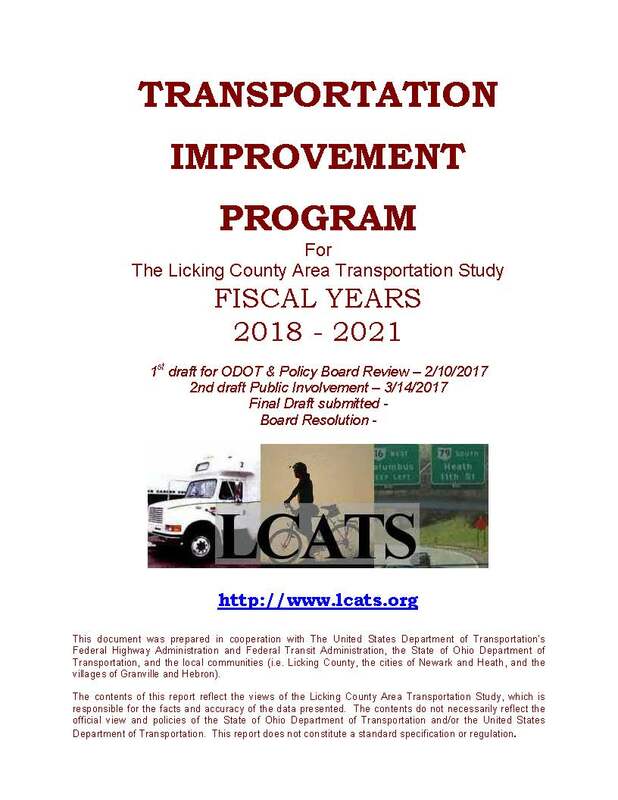 It serves as a guide for the LCATS Policy Committee to make decisions regarding transportation improvements within the LCATS Service area. The purpose of the Corridor Concept Plan was to work with the Steering Committee to identify principles to utilize in creating the development plan. 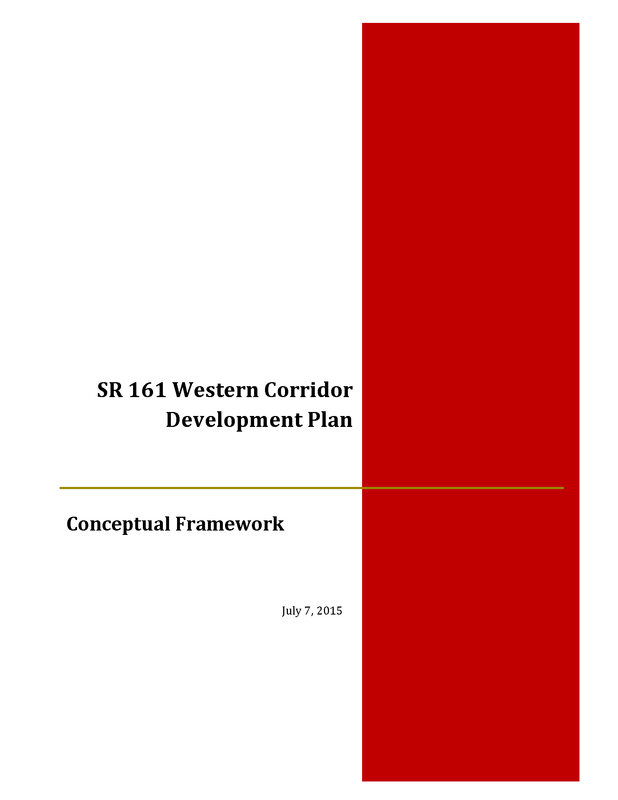 The conceptual development framework describes the community’s intent for where and how future growth and development should occur along the SR 161 Western Corridor. It consists of principle statements that describe that intent in words and a map that illustrates where these concepts apply geographically. The Transportation Improvement Program (TIP) is a four-year short-range document that is the implementation of the Long-Range Transportation Plan. 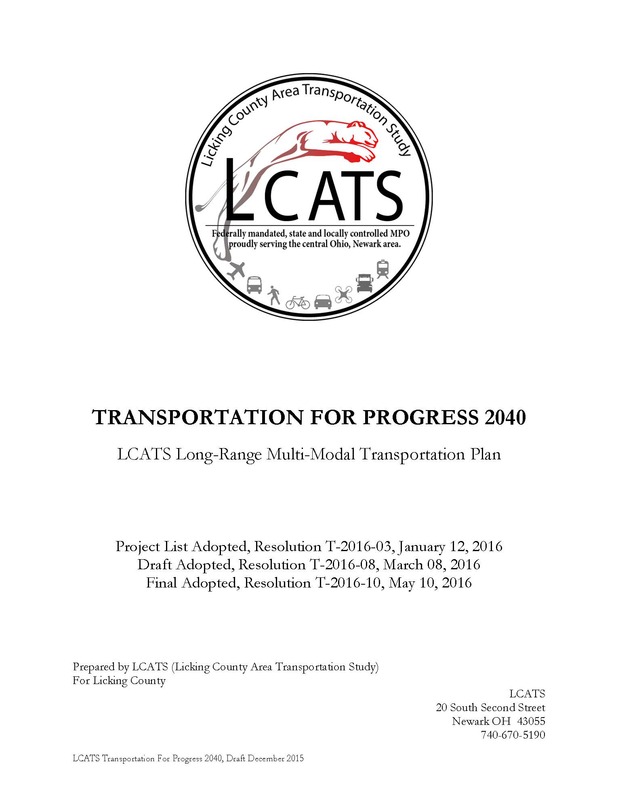 The LCATS TIP demonstrates consistency with the LCATS Transportation Plan. The TIP covers four years of federal transportation funding. LCATS traced the funding and implementation of surface transportation projects and programs in the past and reported the progress of projects in the Transportation Improvement Program (TIP). This report is intended to meet the requirements of MAP-21 as noted above. LCATS uses Ohio’s State Fiscal Year 2017 (July 1, 2017 to June 30, 2018) for reporting.